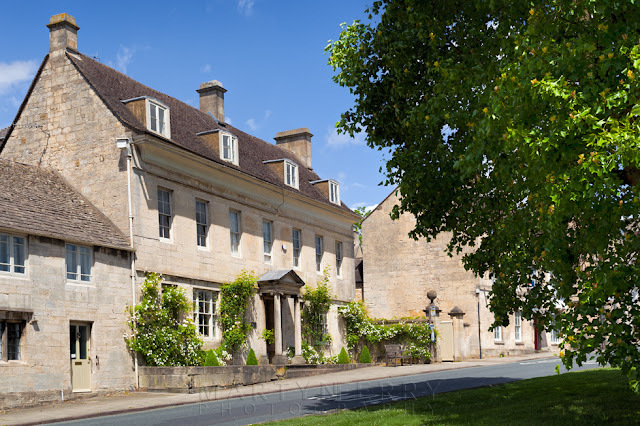 A few weeks ago I had a little excursion over to the West Cotswolds, around the Stroud area, as it was one of the few areas of the Cotswolds that I hadn’t spent much time. Unlike the gentle rolling landscape that is familiar Cotswold terrain, the west is marked by a steep escarpment down to the Severn Valley. 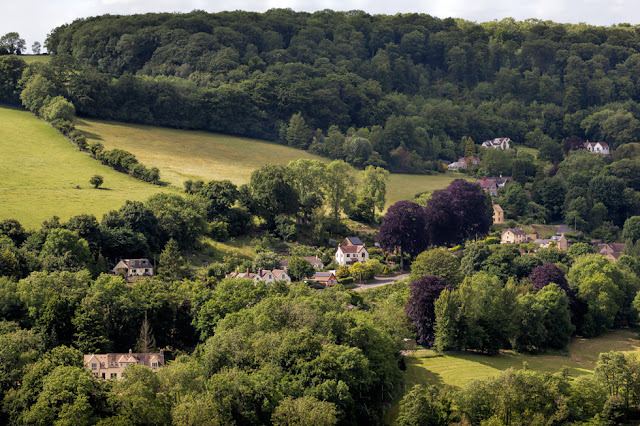 This is known as the Cotswold escarpment, or the Cotswold Edge, and is a result of the uplifting (tilting) of the limestone layer, exposing its broken edge. As a result, the villages and towns that reside here are so well nestled into the steep, undulating terrain, that from a distance, they often have the appearance of looking like they have grown directly from the earth, and are a natural part of the topography. 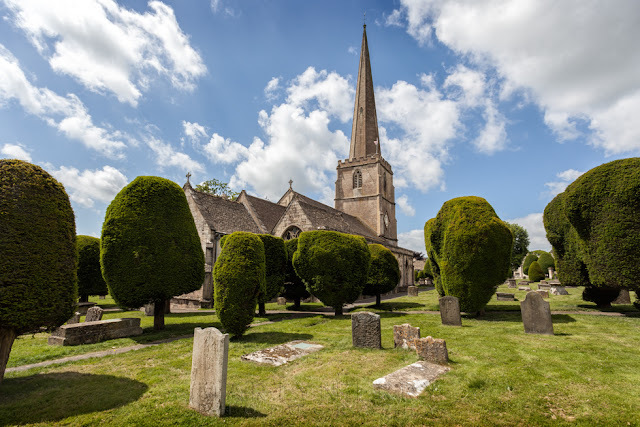 St. Mary's Church and some of its ancient yew trees. 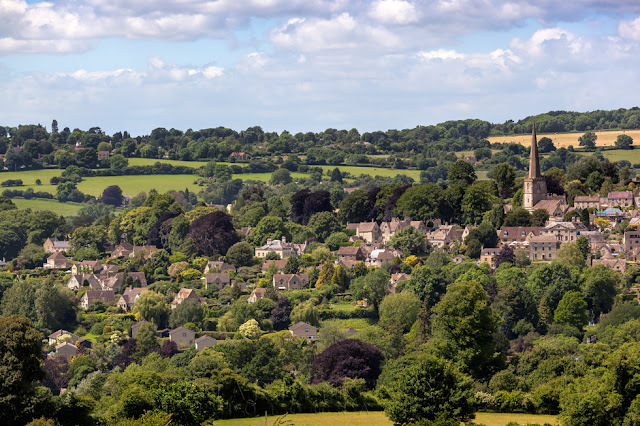 My first stop was in the beautiful town of Painswick, which first appeared in the Domesday Book, as Painswik, probably named for an earlier lord of the manor, Pain Fitzjohn, one of King Henry I ‘new men’ and who also owned Ludlow Castle in Shropshire. One of England’s oldest wool towns, and sitting on a hilltop, it is one of the best preserved settlements in the Cotswolds. 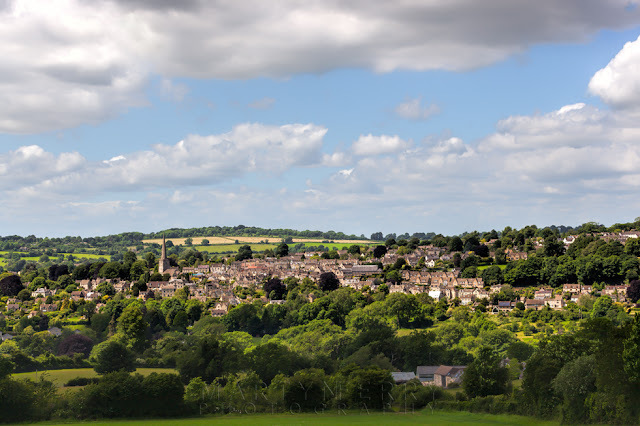 Built from the mellow honey-coloured stone from nearby Painswick Beacon, the town justifies its name as ‘The Queen of the Cotswolds’. Up until recently, it was home to the oldest building in England to hold a Post Office, sadly, this has recently closed. 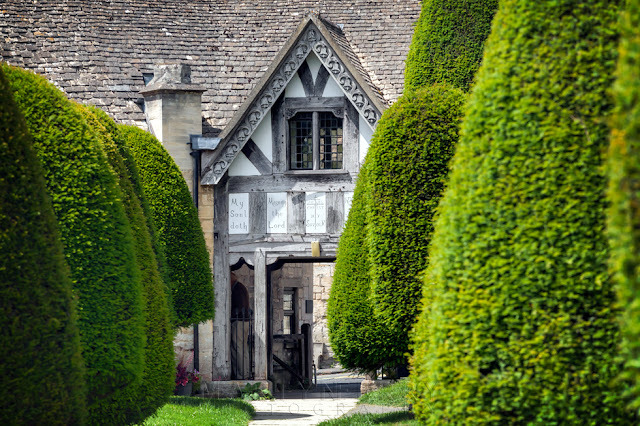 Looking through an avenue of yews towards the lych gate. St. Mary’s Church is a Grade I listed building, with its oldest part, the north chapel, being constructed in 1377. During the English Civil War the church was occupied by the Parliamentarians, until the royalists captured the village in 1644, after severe fighting. Bullet and cannon shot marks remain on the church tower to this day. 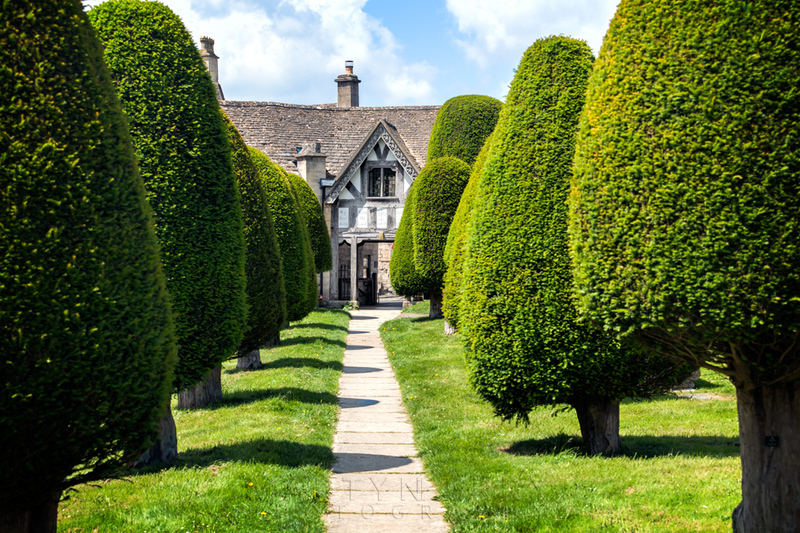 The churchyard is home to 99 yew trees, which were planted in 1792. Legend has it that every time a 100th tree is planted, it won’t grow, legend also has it that it’s impossible to correctly count all 99. Although this is somewhat negated as each tree is now numbered with a little plaque. One of Painswick's many fine streets, with nary a dog to be seen. Each year on the Sunday after the feast of the nativity the children of Painswick encircle the church of St. Mary, join hands and perform a dance not unlike the Hokey-Kokie. During the dance a clypping song is sung, this is believed to express the parishioner’s love of the church. There are only a few churches left in the country that still carry out this ceremony. The beautiful spire of St. Mary’s Church, stands some 639 feet above sea level. Interestingly, in ancient times this was a very riotous occasion with many visitors flooding into the town to view the ceremony, bringing with them a great deal of drunkenness and lewd behaviour, along with a huge demand for food, and with local hostelries being desperate for meat, they resorted to making ‘Puppy Dog’ pies. Thankfully this tradition continues, with Painswick being the only place in the UK where eateries are allowed to serve canine meat, and which is why, you will never see a stray hound anywhere near the town. Some of the 17th century chest tombs, carved by local craftsmen. I’m kidding of course! This custom is re-enacted now, but with china dogs baked into pies instead. 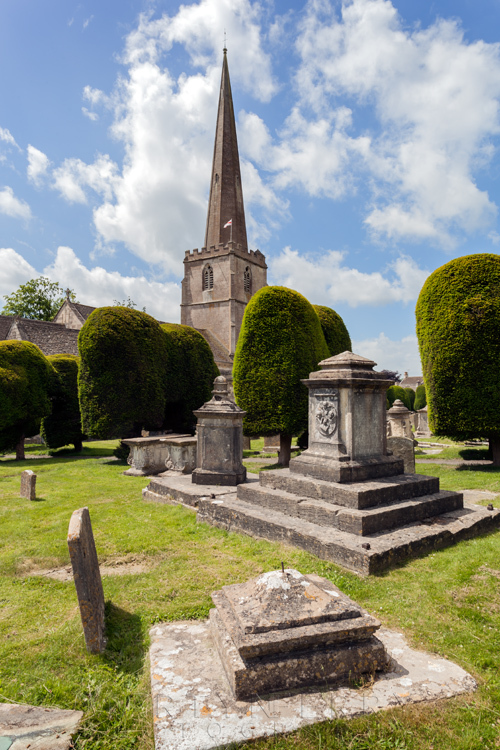 Although for some reason, you really will not see a stray dog in Painswick. The Grade II listed half-timbered lych gate was built in 1901, with timbers from the old belfry. Many churches have a lych gate built over the main entrance to the enclosed area round the church. The name, also spelt lich or lytch, is from the Anglo Saxon 'lich' meaning corpse. The gate marks the division between consecrated and unconsecrated ground, where the bearers sheltered with the coffin, waiting for the clergyman to lead the procession before the burial. 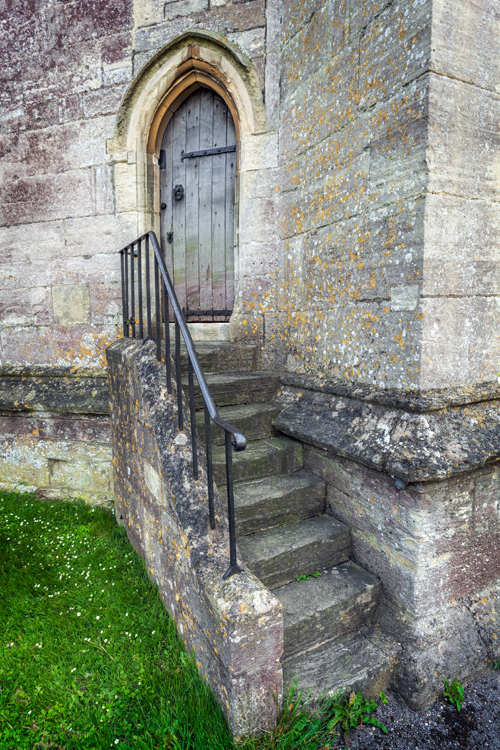 The original lych gates had seats, a lych cross and a lych stone - a slab on which the coffin rested. After spending a good amount of time in Painswick, I headed out into the countryside to get a view of the little village of Cranham. Here you can see an example of what I was nattering about earlier, how the settlement looks like it is part of the landscape, how it really seems to belong there. 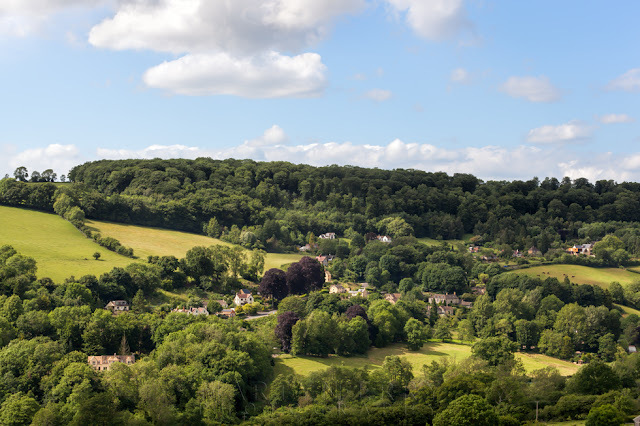 Cranham village and surrounding landscape. Apart from being an idyllic little village, Cranham was home to Gustav Holst for a while, and it was in ‘Midwinter Cottage’ that he wrote In the Bleak Midwinter for the Christmas Carol by Christina Rossetti. Cranham Sanatorium, which has since been demolished, was where George Orwell, in a bid to find some relief to the tuberculosis that would kill him 6 months later, put the finishing touches to 1984. The view in autumn must be quite spectacular. In part two, we visit the unspoiled and out of the way, Duntisbourne villages.